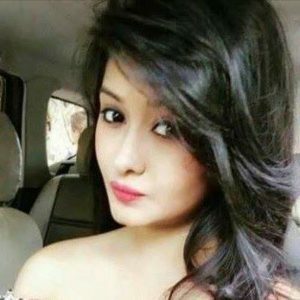 All the girls in their childhood dream to learn how to make beautiful eye makeup, which would be not only well-chosen shadows, but also professional technique of application. We are ready to dispel the myth that professional eye makeup is a complex process, subject only to real make-up artists. With these tricks, any woman can create a seductive look without much effort and special skills. Let’s get started !? 1. First of all, you must clearly understand what your eye shape is. It is necessary to know this in order to choose the technique of shading of shadows, which will help to hide your little “shortcomings”. Eyes come in several forms: widely planted, closely planted, deeply planted, convex, with an impending eyelid, almond-shaped, oriental or Asian, with lowered outer corners, large, small. For each form of the eye, there is a technique of applying shadows, which will favorably emphasize the look. A little bit of advice: you can define the shape using a normal photo. Take a photo of your eyes at close range. Be sure to relax so that there are no wrinkles in the corners of your eyes. 2. 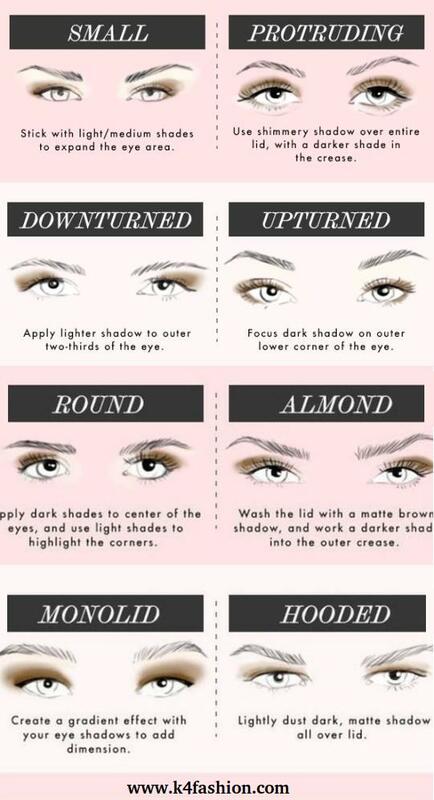 To properly apply shadows and use master classes, you need to know the names of parts of the century and eyes. 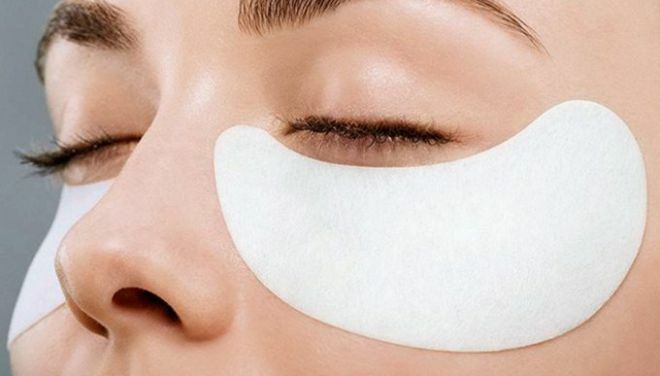 Needless to say, you can not properly make up your eyes if you do not know where the inner and outer corners of the eye are, or the inner contour of the lower eyelid. Share a small trick that will help refresh your makeup and make the look fresh and expressive, especially at the end of the day. 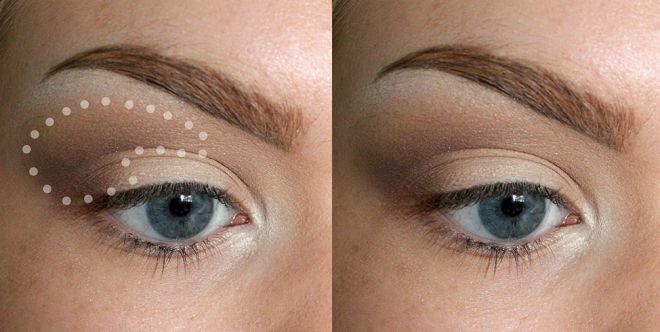 Take light shadows, preferably milky or white and apply a little on the inner corners of the eyes. You will be pleasantly surprised by the result you will see in the mirror. 3. Remember the rule: every eye makeup brush has its purpose, so do not use one brush at once for everything. Let’s open a small secret – for a correct eye make-up enough 3 brushes. Therefore, to begin with, it is enough to buy a brush for feathering, a flat and sloping brush. And do not forget that the brushes must be washed periodically, because they accumulate a large number of bacteria and dirt. A little tip: just wash the brush with the pile down so that it does not lose its shape. Wet the brush, apply a small amount of detergent on the palm and gently spread it over the brush.Then rinse with water. To quickly clean the brushes, you can use a cotton disc moistened in micellar water. Or you can buy a special tool for cleaning cosmetic brushes. 4. Use a variety of cosmetics. There are several types of eye shadow that have certain advantages. In the market of goods you can find cream, pressed and crumbly shadows. 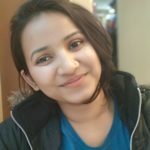 For example, cream shadows are best used as a base for crumbly shadows on the entire surface of the mobile age or, if you use only 1 color of shadows. Friable shadows are not easy to use, but strongly pigmented. 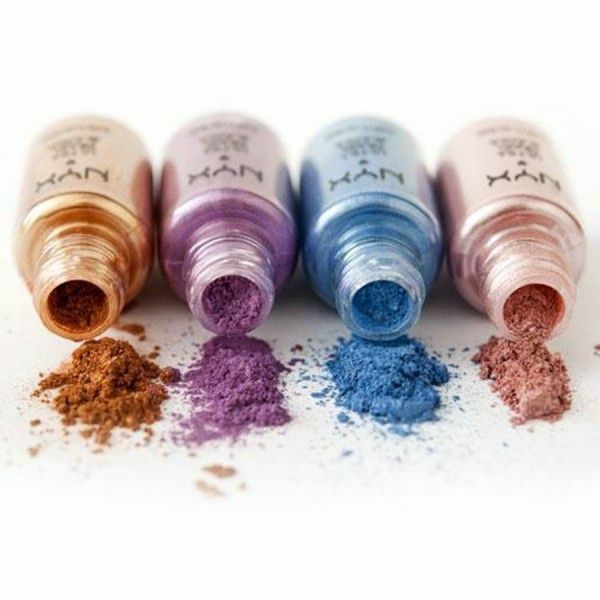 They are good for using if you want a bright and rich color. Be sure to put such shadows on the base, otherwise they will constantly slide down. Pressed shadows have a wide palette of colors, the most easy to use and mix well with each other. 5. 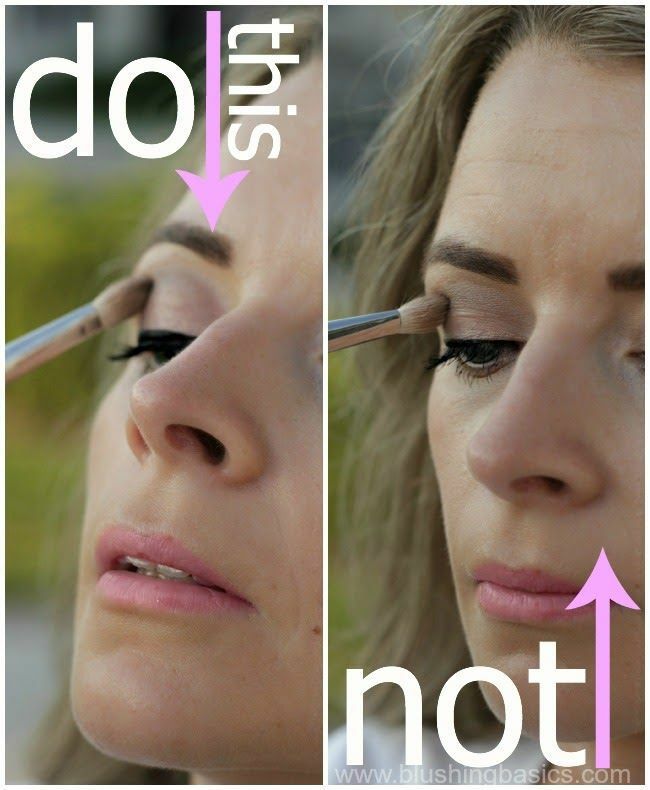 Do not neglect the makeup base. 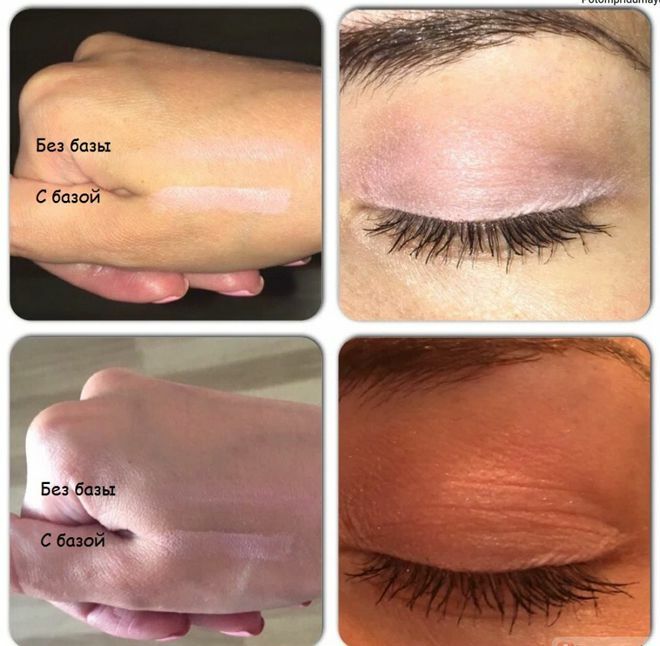 If you want to enjoy your makeup throughout the day, then do not forget to use the base, which is applied to the eyelid, before applying the shadows. 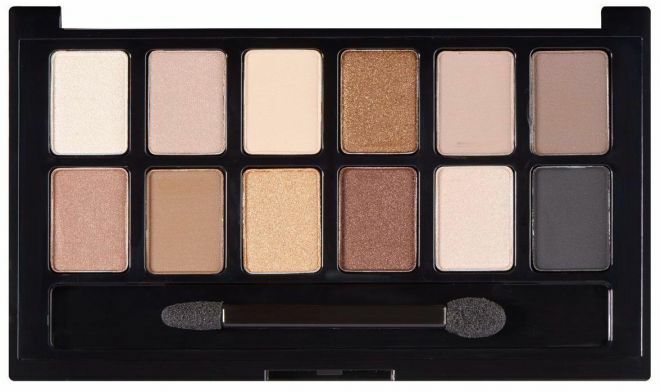 It will allow makeup to look more saturated, and most importantly – no rolling shadows. 6. White pencil strengthens the color of any shadows. In order to make the color of the shadows brighter, you need to apply a white pencil on the eyelid, slightly shade, and only then apply the shadows of the desired color. Conduct an experiment: for one eye, just apply a shadow, and on the other eye – a white pencil and shadows. The difference will be immense. 7. 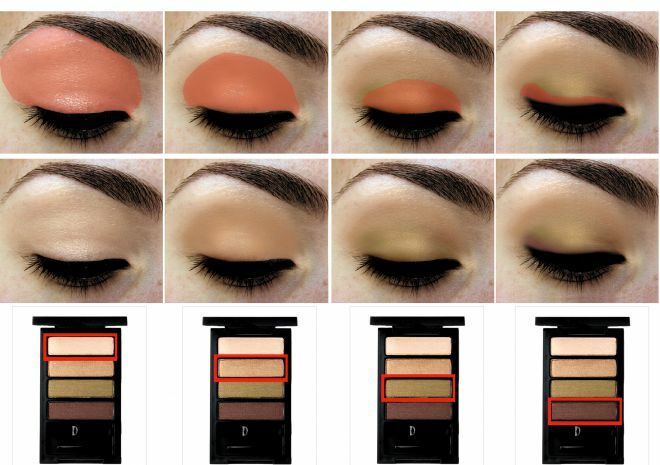 If the palette consists of 4 colors, then you can make a smart eye makeup, knowing where and for what to use each cell of the shadows. 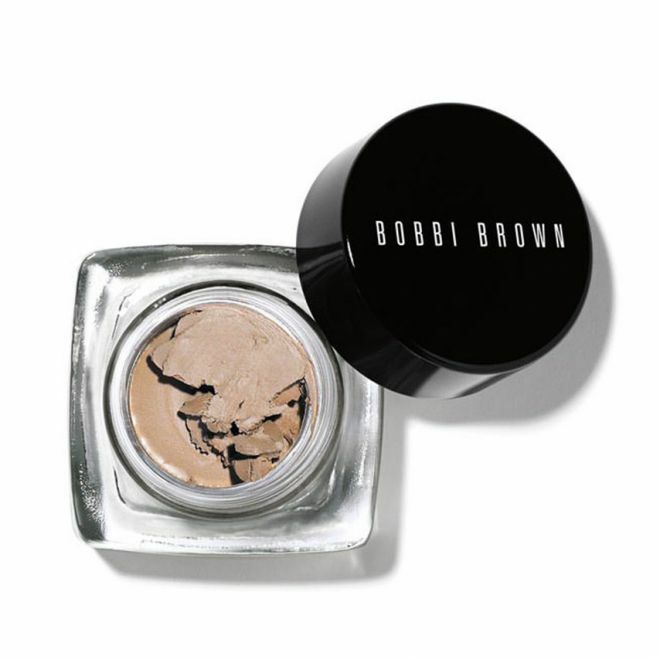 Adhere to the following recommendations: the lightest shade of shadows is best used as a highlighter under the eyebrow. The second light shade is for the mobile century. Dark color is used to highlight the folds of the upper eyelid, and the darkest shade is for the outer corner of the eyes. Similar pallets are good in that they already have colors that are successfully combined with each other, without creating dirty divorces. 8. To apply the main color, you need to pat, as if “driving” the movements to put a shadow on the entire surface of the century. This method of applying shadows allows you to get rid of shedding and add saturation even to ordinary pearlescent shades. Try to apply any color in several layers in a similar way and immediately see the difference. 9. To gently shade the shadows on the borders with each other, use soft, smooth circular motions. Feel the shadows gradually with the help of a fluffy brush for feathering. Circular motions move in the direction of the border between the shadows, achieving an ideal transition of one color to another. 10. 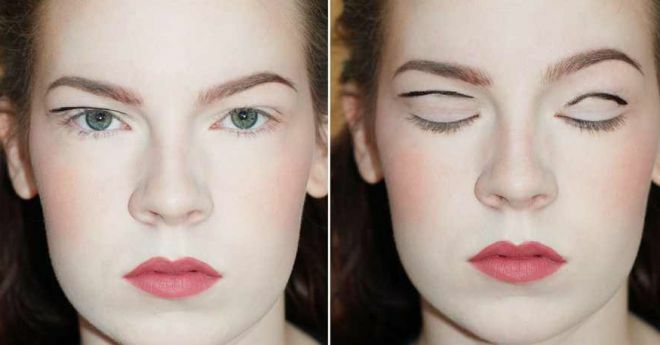 The fold of the eyelid is an important part in any make-up of the eyes. Only correctly applied shadows on this area will help create the desired effect. After you have emphasized the crease, take a brush to shade the shadows and gently walk across the fold, creating a haze effect. 11. Do not be afraid to experiment with the technique of applying shadows. If in the makeup process you have made too clear boundaries of shadows, then do not worry. With the help of feathering, you can give them absolutely any shape with blurry edges.The main thing is that your movements are soft and smooth. 12. 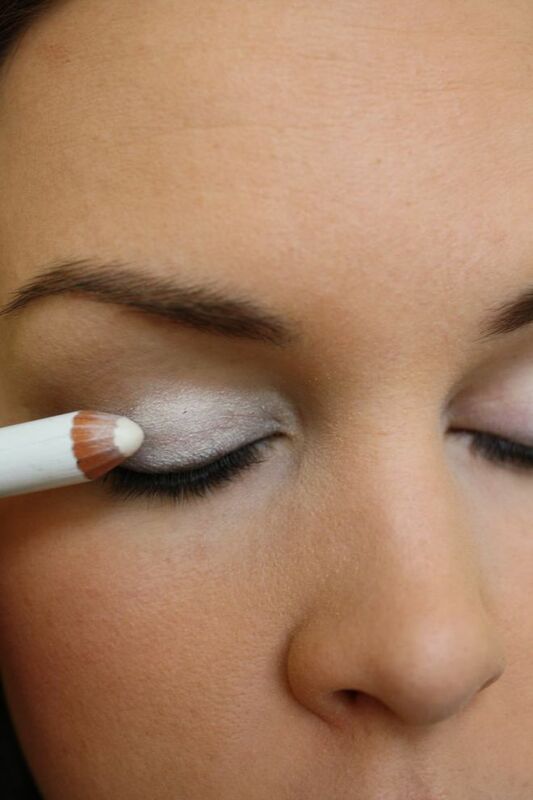 There is one trick that many make-up artists like to use: a pencil applied under the eye shadow. 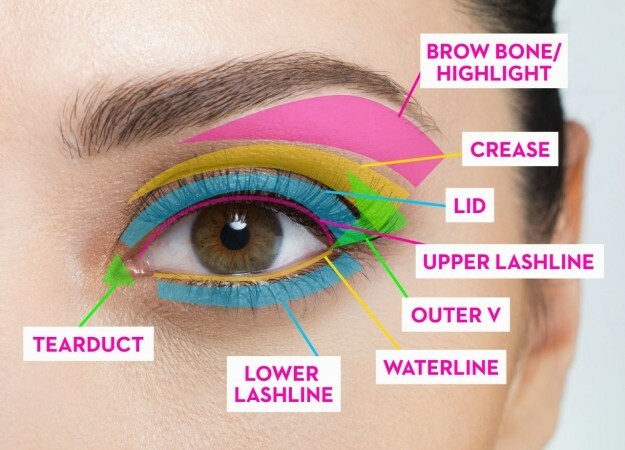 To give your eyes a certain shape, as mentioned above, you need to practice a lot.Therefore, many beginning make-up artists use a pencil to draw the desired shape of applying shadows. In fact, it’s easy. Try it. 13. If you have hanging eyelids, then try to do makeup with your eyes open. It is understood that with open eyes you can more accurately emphasize the fold of the upper eyelid. 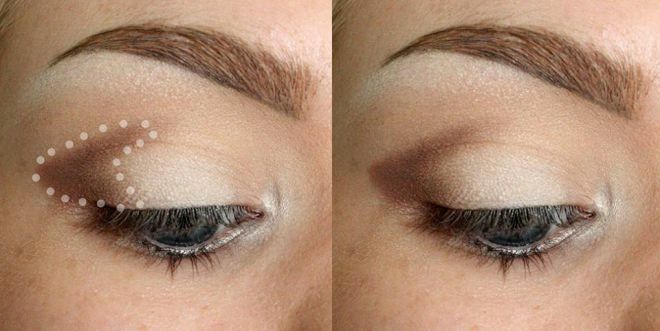 Most women with impending eyelids make the mistake of doing makeup on the closed eye. The result is a make-up that emphasizes all the shortcomings of this structure of your eyes. 14. When applying the shadows, keep the head slightly raised. With this trick you can better see the necessary border of feathering your shadows and the color saturation. 15. 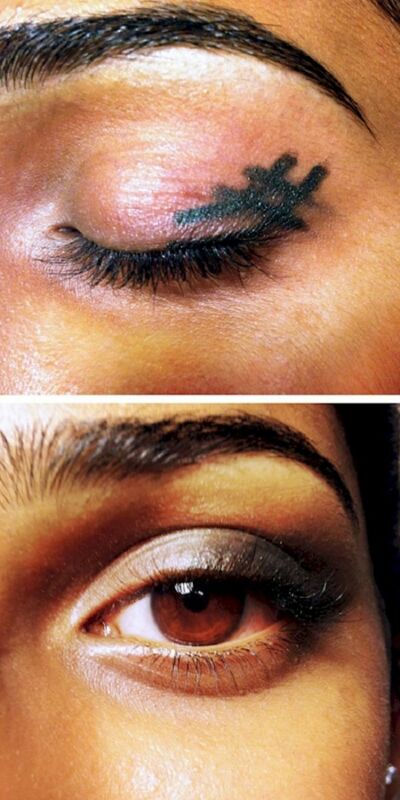 To properly emphasize the outer corner of the eye, draw a pencil icon “grating” on the eyelid. There is a small trick that allows you to pinpoint the area where you want to apply shadows of the darkest shade. Take a soft pencil and in the outer corner draw a grate, as shown in the picture. And then lightly circular motions blend it. If the brush does not work to shade the pencil, then use a cotton pad. Voila, the corner is highlighted! 16. Remember that the shadows fall on the upper part of the cheek and cheekbone, so the foundation is applied after the eye make-up has been done. There are several ways how you can get rid of shattered shadows without smearing them.You can use any of the ones you like. 1. Take a piece of scotch that will easily remove all the “extra” shadows under the eyes.Before using scotch, stick it on your arm first to test and avoid irritation on the surface of the skin of the face. 2. 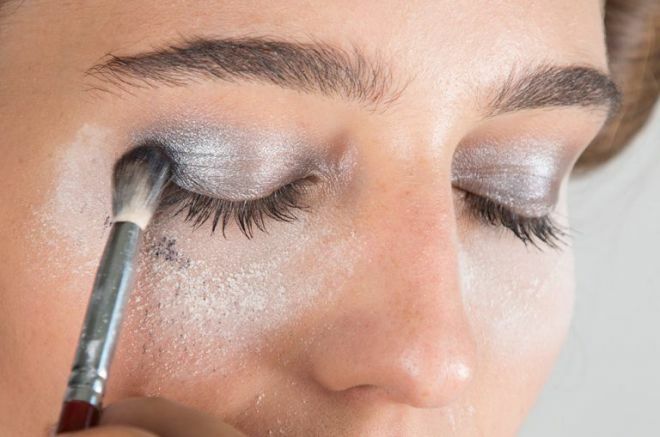 The second way is using loose powder, which you need to put under your eyes before you start applying the shadows. When the make-up is finished, take a large powder brush and brush off the remains of the shadows and powder from your cheeks. 3. And, the third option, is to use professional means. In the cosmetics store you can find a huge assortment of products that you can easily remove any mistake made during the make-up of the eyes. 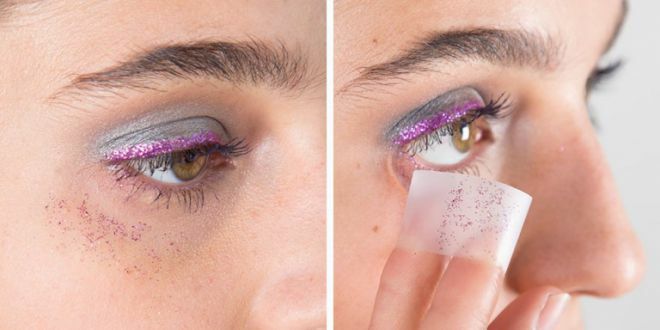 Also, you can purchase special adhesive stickers that you can remove after you make eye makeup. 17. Remember that any make-up must be secured. To make the makeup last as long as possible, it should be fixed with special sprays. Do not be discouraged if the art of make-up does not lend itself to the first time. Everything takes practice and a lot of time. Using our tips, in time you can create a beautiful make-up that makes your look more expressive. 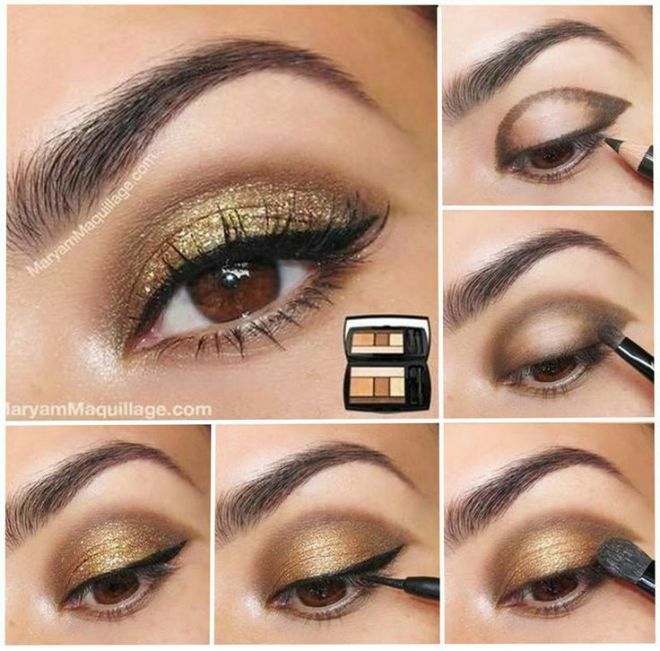 Hope you like these EYE Makeup tricks.